A simple but powerful way to determine whether or not there's a irrational bubble is to look for a lot of people who are participating in a trend who have no business doing so. For instance, a Mexican strawberry-picker making $15,000 a year who gets a $720,000 loan for a home. If these don't-belong-there people make up a larger and larger fraction of all who get loans, that strongly suggests that everyone is trying to get in on a speculative bubble -- and that the gatekeepers of the activity are increasingly debauching their entry standards to accommodate the losers. One datum that suggests an irrational bubble in education is that a much larger fraction of the population is going to college now, and that not surprisingly the average IQ of college students has declined by about 2/3 s.d. -- admissions boards began to scrape deeper down into the sludgebucket of society. How about looking even earlier? High school is compulsory, so we can't really use high school enrollment to judge whether there's a bubble or not. But what about the sub-group of high school that ostensibly is there to prepare college-bound students for college? That is up to the choice of students, perhaps being bullied by their parents. There is strong evidence even at this early stage of an irrational bubble. What got me thinking about this was a recent NYT article on how teachers feel about the Advanced Placement program, which is based on a report from the Thomas B. Fordham Institute. The key item that popped out was the claim that participation in the AP program has exploded in recent years, and that this has made a fair fraction of teachers anxious about whether there are students there who shouldn't be. This sure smells like a bubble. An exponential trend accounts for 99.8% of the year-to-year variation for the total number of tests taken, and 99.2% in the per capita case. So, clearly participation in the AP program has been exploding at least since 1988. Now, is there a sound basis for this increase -- like, maybe kids these days are just getting exponentially smarter? Without looking at the data, we know this is wrong since the main determinant of doing well in AP classes is IQ, and that is influenced mostly by genes and unpredictable aspects of the environment, which haven't been changing so rapidly from one year to the next. Turning to data on how well 17 year-olds are doing academically, let's look at some tables from the 2007 version of the Digest of Education Statistics (all under Chapter 2, and then Educational Achievement). Table 112 shows that on the National Assessment of Educational Progress, the average reading score for 17 y.o.s did not change from 1971 to 2004. Table 115 shows that the percent of 17 y.o. students who are at the 300 level or above in reading did not change from 1971 to 2004. Tables 125 and 126 show the same lack of change for math skills tested by the NAEP. Table 135 shows that the average Critical Reading score on the SAT did not change from 1988 onward -- indeed, it was steady back to about 1976, and had been declining before then. There was a modest uptick in Math scores (15 points, or 0.15 s.d.). The Critical Reading or Verbal score is more highly g-loaded than the Math score for the SAT, or is a better measure of IQ, which means the apparent uptick in Math scores may not mean as much as we'd think. 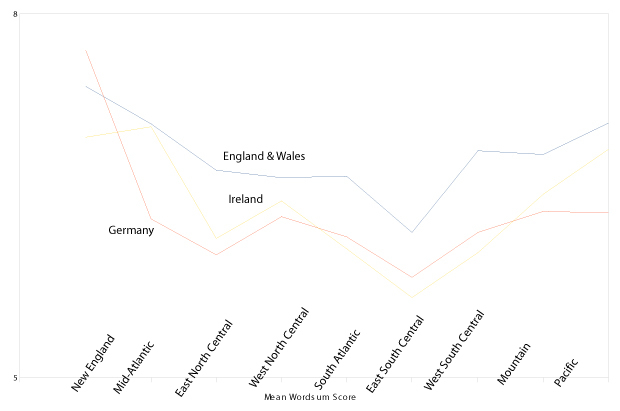 The first shows the distribution of AP scores, where 5 is greatest. You can check the numbers for yourself in the previous link to the AP data, but there has been no change in the percent of all tests that received a score of 4 or 5 -- there have not been more and more smarties piling into AP classrooms, at least not since 1988. Therefore, everyone who deserved to be there was already there. However, the percent of all tests receiving a score of 1 -- telling the student, "why did you even bother?" -- has doubled from 10% to 21%. Those receiving a 2 shrunk a tiny amount, from about 23% to 21%. But those receiving a 3 declined from about 32% to 24%. 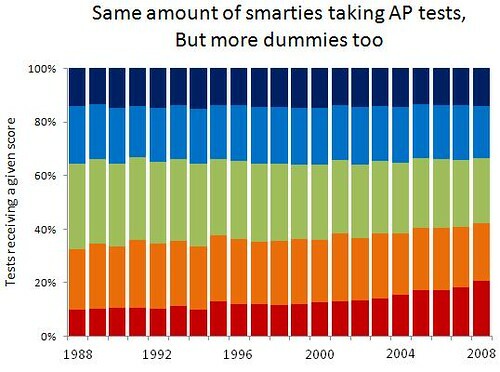 This means that, unlike for smarties, more and more dummies have been allowed into the AP program. This is reflected in the change in the mean and standard deviation of test scores: keeping the smarties fixed while adding a lot more dummies will drag down the mean and increase the heterogeneity or variance. That's analogous to the housing bubble causing a decline in the mean creditworthiness of the population of borrowers, and an increase in their heterogeneity, as both the sound and the unsound begin to rub shoulders in loan offices. And just as lenders increasingly cheapened their standards by not requiring down payments or proof of income, so high school teachers and administrators have allowed increasingly ill-prepared -- stupid -- students into the AP program. In sum, there is very strong evidence from AP tests for a speculative bubble in education. Most of what I've read on whether or not such a bubble exists has focused on college -- soaring tuition, more and therefore dumber students, and so on. These data, though, show that the mania extends even to high school, not just higher ed. For at least the past five years, there have been many news stories about competitive admission to pre-school, so perhaps someone could dig up some numbers to show an exponential increase there too that can't be rationalized by a change in fundamentals. In any case, it's clear that this bubble is much more general than the college data suggest. Curiously, the phrase "education bubble" has not appeared at all in the NYT, although it has appeared many times in the blogs that the newspaper hosts. Googling the phrase gets 39,000 hits. Rises and falls in tuition get plenty of coverage, but that doesn't show that the reporters are aware of the irrational bubble -- they just think it's unfair, that college should be cheaper so that more can attend. But just as no one was allowed to say that most low-income borrowers were undeserving of home loans since they were disproportionately black and Hispanic, so we aren't allowed to say that a lot of college students are nowhere near being "college material" -- that would violate the "demotic life and times," as Jacques Barzun has dubbed the zeitgeist from roughly the 1960s until today. We cripple our minds by imbibing political correctness. The bursting of the education bubble may be decades away -- it sure has been going on for awhile, so its period may be much longer than that of the housing or stock market bubbles. Let's just hope that when it happens, it will turn out that hedge funds and investment banks won't have exposed themselves to all of this silliness, and that we won't be plunged into another multi-year recession. If you want to do well [in college], you should have an IQ of 115 or higher. Put another way, it makes sense for only about 15% of the population, 25% if one stretches it, to get a college education. And yet more than ... 40% of all persons in their late teens are trying to go to a four-year college--enough people to absorb everyone down through an IQ of 104. Several months ago, the Inductivist found this to be a canny estimate: in the 1960s the average college graduate had an IQ very close to 115, and today the average college graduate has an IQ of 105. They are in college to improve their chances of making a good living ... and would do better in vocational training ... two-year colleges ... [are] about right for learning many technical specialties, while four years is unnecessarily long ... Finding a good lawyer or physician is easy. Finding a good carpenter, painter, electrician, plumber, glazier, mason--the list goes on and on--is difficult, and it is a seller's market. Journeymen craftsmen routinely make incomes in the top half of the income distribution while master craftsmen can make six figures. I find the thinking here plausible, and these seem like testable enough ideas. Luckily, all the relevant variables are included in the General Social Survey. It's graph day on gnxp. The x axis in the figure below represents the number of correct answers on the 10 question WORDSUM mini IQ test included in the GSS. 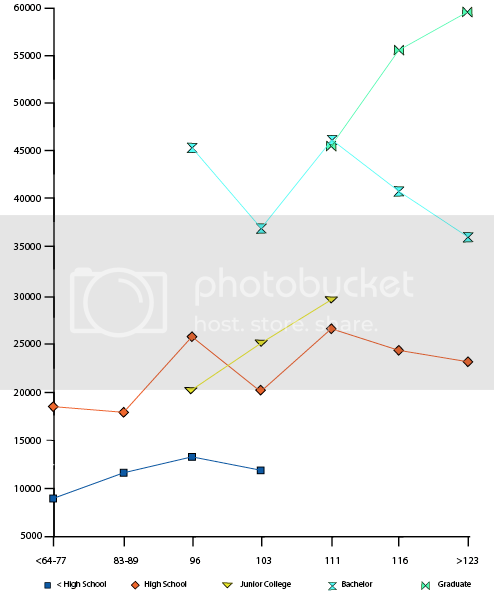 The y axis represents the respondent's income in constant dollars. 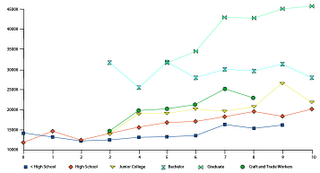 The colored lines represent five educational categories, and one occupational category. Moving left to right we see the average income of people in each category as their IQ score increases from 0-10 correct answers. 'Junior college' represents the two-year vocational degree Murray references. And 'Craft and Trade Workers' covers over 50 skilled trade categories like electrician, mason, plumber, carpenter, and mechanic, coded by the survey. The first observation here is that educational degrees, whether they confer skills or credentials, are more important to income than IQ when minimum thresholds are met. Trade workers, and 2 and 4-year college graduates are not significantly represented in the lowest three IQ categories. Graduate holders have an even higher minimum IQ. Second, income rises within 5 of the 6 categories as IQ increases. Higher IQ generates the biggest pay-off differences between those with advanced degrees, which is consistent with IQ increasing in importance as jobs become more complex. Third, merely earning a Bachelor's degree is a golden ticket. People with average and below average IQs are getting just as much of a financial return out of their 4-year degree as those above the 85th percentile. This suggests many more people of marginal ability should be seeking a Bachelor's degree, not less. Fourth, the two lines for junior college and trade occupations overlap substantially, as we would expect if most people in trade occupations went to trade school. Fifth, and most directly related to Murray's argument, people with 4-year degrees earn much more than people with 2-year degrees and trade jobs at every level of IQ. Average IQ people will get a much, much larger monetary reward from completing a 4 year school than a 2 year school. So the BA is far from being a "meaningless credential" when it comes to "chances of making a good living". It's possible people with average IQs who complete college are exceptional in other ways. But there is no other empirical evidence that vocational school is better at generating income for those <85th percentile. Also, secular trends could distort data in the first graph, which combines all survey data from 1972-2006. So the second graph below represents only people who were 35 and older and surveyed between 2000-2006. Fortunately, the results are not too different from the first graph. The IQ categories are condensed and transformed, and we see that 96 is about the minimum to complete 2 and 4 year college, and 111 the minimum for graduate degrees. Again we find that IQ shows no relationship to income for those with a BA, and, in fact, those with lower IQs might profit the most. For those without advanced degrees, people who are moderately above and moderately below average intelligence might earn the most (this balance might be because other socially valued personality traits, like masculinity, are inversely associated with IQ). So, while I have yet to read Real Education -- which may address these issues -- it would appear that Murray is mistaken in some of his crucial premises. Still undetermined is if people with 4 year degrees earn a lot more money because they actually acquire important skills, or if inefficient laws/taboos against employee IQ testing, sustain a comically messy and tragically expensive employment screening method. If the latter was true Murray could still be partially correct: 4 year college could be worthless for the <85th percentile, if employers began to use 20 minutes of psychometric testing, instead of 4 year degrees, as their screening filter. But, ceteris paribus, college is still the best pay-off. General intelligence (g) has been one of the most, if not the most, aggressively studied constructs in psychology. Type the search string "general intelligence" in PsycInfo and you will return over 2000 entries, and a similar search in Pubmed pulls up over 400. If you broaden the term to just "intelligence", the respective number of entries are 65405 and 37166. While not all of the results focus on g , (e.g., AI, "social intelligence"), a large portion of them do, and the prospect of meandering your way through can be intimidating. Fortunately, the overall literature is consistent and, at least for me, highly engaging. The study of g can be bifurcated into two distinct areas: vertical and horizontal g . Vertical g is the domain that studies g's biological relationships. It is the area that is going to eventually assimilate enough data and literature to elucidate, unquestionably, the causal mechanisms of g . From this field of study, we know that g is correlated with a variety of neural mechanisms, such at glucose metabolism (Haier, 2003), cortical development (Shaw et al., 2006), and biochemical activity (Jung et al., 2005). We know that g is highly heritable, both when measured psychometrically (Plomin & Spinath, 2002) or chronometrically (Beaujean, 2005). We know that g decreases with inbreeding (Jensen, 1983) and increases with hybrid vigor (Nagoshi & Johnson, 1986). As genome scanning becomingmore popular, we are now even beginning to see some specific genes that are implicated g.
As interesting as vertical g is, however, this entry is going to instead focus in the horizontal aspects of g . That is, how does g play out into "everyday life." Specifically, we will look three different, although related, areas: education, occupation, and general life outcomes. 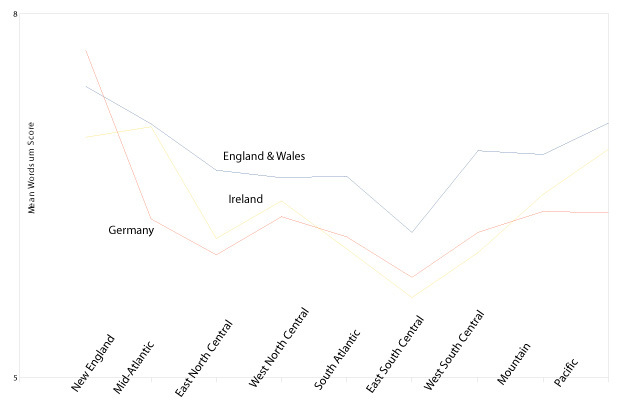 The reasons for doing so are twofold: (a) the more the science of horizontal g is positively promulgated, then, perhaps, the more likely people are to support the needed research into vertical g and (b) even though this area of research has been around for over a century (e.g., Galton, 1869), there are still new, important findings. Before delving into horizontal g, however, it would behoove us to delineate a mechanism by which g could influence education, occupation, and general life outcomes.For our purposes, that mechanism is information processing. Generally defined, information processing is the pathway and mechanisms by which stimuli are perceived, attended to, retrieved, and/or used to solve problems and/or cope with exigencies in the environment (Jensen, 1998a). The cognitive psychology literature is chalked full of the nuances of the various information-processing theorists, the specifics are which cannot be delineated here (an easy-to-read intro: Ormrod, 2004). Yet, within all these theories lies the idea that people respond to stimuli in a way that involves many mechanisms (e.g., sensory register, primary memory)and a variety of neurological regions (e.g., hippocampus, amygdala, mammillary bodies). The consequence? There is ample room for individual differences in the speed and efficiency in which information is processed. From another perspective (e.g., Kline, 1998), information is processed in irreducibly small pieces (often called bits) and the time it takes to process those bits is the BIP, the Basic period of Information Processing. Now, the time it takes Johnny to process the fact that the only integer between 2 and 4 is 3 is going to be different than the time it takes Jane. Multiply those differences by the number of people processing the fact, and voila! individual differences. This is probably the area most replete with data and, unsurprisingly, the g-educational achievement relationship is strong. In fact, although it differs by grade level (with it decreasing as grade level increases), most of the non-random variance in scholastic performance is accounted for by g (Thorndike, 1984). Jensen (1989, 1998b) writes that this is so due to the fact that "school learning" is, itself, quite g -loaded. Of course, there are those who write that g is just a product of education (e.g., Ceci, 1991; for a review of others, see Gottfredson, 1986), or, perhaps more egregious, that g and educational achievement are just products of the tests designed to measure them (for review and rebuttal, see Jensen, 1984). But these arguments quickly dissipate when looking at the evidence. For example, in the latest issue of Intelligence, there were two longitudinal studies (Deary, Strand, Smith, & Fernandes, 2007; Watkins, Lei, & Canivez, 2007) that showed a strong IQ --> Educational Achievement relationship (approx. 70 from Deary), but reverse (i.e., EA --> IQ) was not there (from the Watkins study). Further evidence comes from the two major "We can improve you Education by improving your IQ" projects: Head Start and the Abecedarian Study. With regard to the former, Head Start just does not produce long-term IQ gains and, hence, does not produce long-term academic gains (Caruso, Taylor, & Detterman, 1982; Holden, 1990; Kreisman, 2003). With regard to the latter, while there has been acrimonious debate, the overall conclusion is that, like Head Start, the initial IQ gains do not last, giving even more evidence that educational achievement cannot be raised independently of g (Spitz, 1986, 1992, 1993b, 1993a). Yet another line for arguing against the prominence of g in education is the idea that there are other traits that are just as necessary for academic success, such as motivation, personality, etc. To risk sounding like to broken record, the data shows that these traits are not nearly as potent predictors as g in predicting academic outcomes. For example, Gagne and St. Pere (2002) gives us reason to believe that motivation might just be an impotent variable in predicting academic achievement. 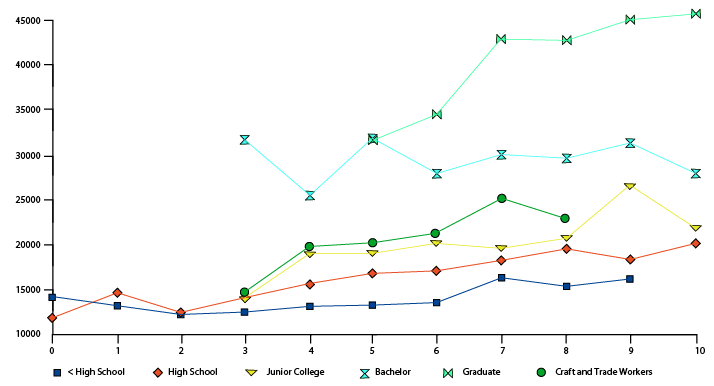 Likewise, Laidra, Pullmann, and Allik (2007) have shown that while personality factors contribute some to the variance in educational achievement, they are dwarfed in comparison to the contribution of g.
One could argue that, given the high g -education relationship, that the g-occupation relationship is just a natural outgrowth.That is, once education is controlled, the g-occupation relationship significantly shrinks. But to make that argument, one would have to have a Sternberg-like approach to intelligence (Sternberg & Wagner, 1993). That is, that the cognitive skills needed for a successful education are somehow vastly different than those needed for everyday life. The data, however, indicate that the same generative process that tends to makes one successful in the educational arena is also the mechanism that tends to make one successful in the occupational arena: g (Kuncel, Hezlett, & Ones, 2004). This is not to say that other things are not important in occupational or educational outcomes; but, as with education, they are not nearly as potent predictors (Gottfredson, 2002). Over the last decade or so, an area that has become of more interest to the intelligence community is the influence of g on general life outcomes. That is, beyond educational and occupational outcomes, does g contribute to life success? The answer here, too, seems to be a resounding yes. Given the ubiquity of g in fostering success in many life outcomes from education achievement to occupational success, from health outcomes to criminal recidivism, social science in general and psychological science in particular would be remiss to "pretend it doesn't matter" (Gottfredson, 2000). Rather, if these fields want to strengthen their scientific integrity and acumen, they should do exact opposite. That is, bring the large, cumulative database on g and its influence on life outcomes to the forefront of a wide array of research agendas so that this corpus of data can serve as the strong underlying foundation of a generation of new investigations on g's life implications. While this line of investigation may never get to the underlying (vertical) mechanisms by which g operates, it can help foster the acceptance of doing such research and pave the way for its societal implications, whatever they may be. Beaujean, A. A. (2005). Heritability of mental processing speed as measured by mental chronometric tasks: A review and meta-analysis. Intelligence, 33, 187-201. Caruso, D. R., Taylor, J. J., & Detterman, D. K. (1982). Intelligence research and intelligent policy. In D. K. Detterman & R. J. Sternberg (Eds. ), How and how much can intelligence be increased? (pp. 45-65). Norwood, NJ: Ablex. Ellis, L., & Walsh, A. (2003). Crime, deliquency, and intelligence: A review of the worldwide literature. In H. Nyborg (Ed. ), The scientific study of general intelligence: Tribute to Arthur R. Jensen (pp. 343-365). New York: Pergamon. Gagne, F., & St. Pere, F. (2002). When IQ is controlled, does motivation still predict achievement? Intelligence, 30, 71-100.
and Intelligence Context. Intelligence, 24, 203-320. Gottfredson, L. S. (1986). Societal consequences ofthe g factor in employment. Journal of vocational behavior, 29, 379-410. Gottfredson, L. S. (2000). Pretending that intelligence doesn't matter. Cerebrum, 2, 75-96. Gottfredson, L. S. (2002). g: Highly general and highly practical. In R. J. Sternberg & E. L. Grigorenko (Eds. ), The general factor of intelligence: How general is it? (pp. 331-380). Mahwah, NJ: Erlbaum. Gottfredson, L. S. (2003). g, jobs, and life. In H. Nyborg (Ed. ), The scientific study of general intelligence: Tribute to Arthur R. Jensen (pp. 293-342). New York: Pergamon. Gottfredson, L. S. (2004a). Intelligence: Is it the epidemiologists' elusive "fundamental cause" of social class inequalities in health? Journal of Personality and Social Psychology, 86, 174-199. Gottfredson, L. S. (2004b). Life, death, and intelligence. Journal of Cognitive Education and Psychology, 4, 23-46. Gottfredson, L. S., & Deary, I. J. (2004). Intelligence predicts health and longevity, but why? Current Directions in Psychological Science, 13, 1-4.
and neurobiology. In R. J. Sternberg, J. Lautrey, & T. I. Lubart (Eds. ), Models of intelligence: International perspectives (pp. 185-193). Washington, DC: American Psychological Association. Herrnstein, R. J., & Murray, C. (1996). Bell curve: Intelligence and class structure in American life. New York: Free Press. Holden, C. (1990, March 23). Head Start enters adulthood. Science, 247, 1402. Jensen, A. R. (1983). 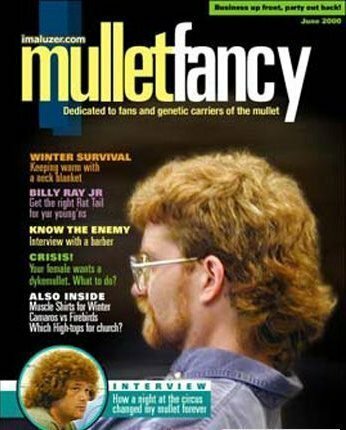 The effects of inbreeding on mental ability factors. Personality and Individual Differences, 4, 71-87. Jensen, A. R. (1984). Test validity: g versus the specificity doctrine. Journal of Social and Biological Structures, 7, 93-118.
and Individual Differences, 1, 37-62. Jensen, A. R. (1998a). The g factor and the design of education. In R. J. Sternberg & W. M. Williams (Eds. ), Intelligence, instruction, and assessment: Theory into practice (pp. 111-131). Mahwah, NJ: Lawrence Erlbaum. Jensen, A. R.(1998b). The g factor: The science of mental ability. Westport, CN: Praeger. intelligence: An 1H-MRS study of normal human brain. Neuroimage, 1, 965-972. Kline, P. (1998). The new psychometrics: Science, psychology and measurement. London: Routledge. Kreisman, M. B. (2003). Evaluating academic outcomes of Head Start: An application of general growthmixture modeling. Early Childhood Research Quarterly, 18, 238-254.
potential, creativity, and job performance: Can one construct predict them all? Journal of Personality and Social Psychology, 86, 148-161. Laidra, K., Pullmann, H., & Allik, J. (2007). Personality and intelligence as predictors of academic achievement: A cross-sectional study from elementary to secondary school. Personality and Individual Differences, 42, 441-451. Nagoshi, C. T., & Johnson, R. C. (1986). The ubiquity of g. Personality and Individual Differences, 7, 201-207. Ormrod, J. E. (2004). Human learning (4th ed.). Upper Saddle River, NJ: Pearson. Shaw, P., Greenstein, D., Lerch, J., Clasen, L., Lenroot, R., Gogtay, N., et al. (2006, Mar 30). Intellectual ability and cortical development in children and adolescents. Nature, 440, 676-679. Spearman, C. E.(1904). "General intelligence": Objectively defined and measured. American Journal of Psychology, 15, 201-292. Spearman, C. E.(2005). The abilities of man: Their nature and measurement. New York: Blackburn Press (Original work published 1927). Spitz, H. H. (1986). The raising of intelligence: A selected history of attempts to raise retarded intelligence. Hillsdale, NJ: Lawrence Erlbaum Associates. Spitz, H. H.(1992). Does the Carolina Abecedarian Early Intervention Project prevent sociocultural mental retardation? Intelligence, 16, 225-237. Spitz, H. H. (1993a). Spitzs reply to Ramey's response to Spitz's first reply to Ramey's first response to Spitz's critique of the Abecedarian Project. Intelligence, 17, 31-35. Spitz, H. H. (1993b). When prophecy fails: On Ramey's response to Spitz's critique of the Abecedarian Project. Intelligence, 17, 17-23. Sternberg, R. J., & Wagner, R. K. (1993). The g-ocentric view of intelligence and job performance is wrong. Current Directions in Psychological Science, 2, 1-5. Thorndike, R. L.(1984). Intelligence as information processing: The mind and the computer. Bloomington, IL: Center on Evaluation, Development, and Research. Watkins, M., Lei, P. W., & Canivez, G. L. (2007). Psychometric intelligence and achievement: A cross-lagged panel analysis. Intelligence, 35, 59-68.